The NASA/ESA Hubble Space Telescope and Hubblecast bring you a new and detailed look at the famous Ring Nebula. The Ring’s distinctive shape makes it a popular illustration for astronomy books. But new observations of the glowing gas shroud around an old, dying, Sun-like star reveal a new twist. Hubble and several ground-based telescopes have combined to obtain the best view yet of the iconic nebula. The images show a more complex structure than astronomers once thought and have allowed them to construct the most precise 3-D model of the nebula. The Ring Nebula is about 2,000 light-years from Earth and measures roughly 1 light-year across. Located in the constellation Lyra, the nebula is a popular target for amateur astronomers. Previous observations by several telescopes had detected the gaseous material in the ring’s central region. But the new view by Hubble’s sharp-eyed Wide Field Camera 3 shows the nebula’s structure in more detail. The ring appears to wrap around a blue, football-shaped structure. Each end of the structure protrudes out of opposite sides of the ring. The dark, irregular knots of dense gas embedded along the inner rim of the ring look like spokes in a bicycle wheel. These gaseous tentacles formed when expanding hot gas pushed into cool gas ejected previously by the doomed star. The knots are more resistant to erosion by the wave of ultraviolet light unleashed by the star. The Hubble images have allowed astronomers to match up the knots with the spikes of light around the bright, main ring, which are a shadow effect. Astronomers have found similar knots in other planetary nebulae. The outer rings were formed when faster-moving gas slammed into slower-moving material. The nebula is expanding at more than 43,000 miles an hour, but the center is moving faster than the expansion of the main ring. The Ring Nebula will continue to expand for another 10,000 years, a short phase in the lifetime of the star. The nebula will become fainter and fainter until it merges with the interstellar medium. Studying the Ring Nebula’s fate will provide insight into the Sun’s demise in another 6 billion years. 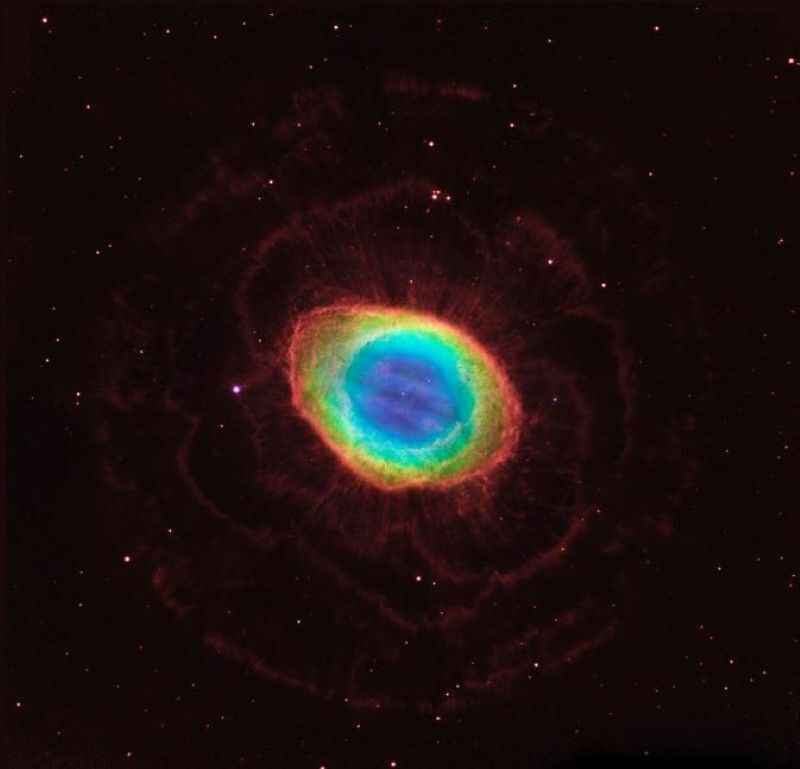 The Sun is less massive than the Ring Nebula’s progenitor star, so it will not have such an opulent ending.